How will you handle election-withdrawal? So what are your plans for Wednesday? A twelve-step program? Maybe a little one-on-one counseling? You know you're probably going to need some help. We all will. There won't be anymore election to fixate on. What a ride it's been– Historic and interesting. Historic because of Barack Obama and Hillary Clinton, and just when it started to get a little boring, Sarah Palin rode out of Alaska and energized the whole thing all over again. Interesting because we have ourselves quite a mess here: The economy, wars, etc. You know it all by now. Those problems awakened the American electorate like never before. But Wednesday, the party's over. Except it's really not. For whoever leads us, it's just beginning, and my guess is we will all be called upon at some point to be part of the solution. But what are we going to do in the meantime? I know for a fact Wolf is going to need help with this. Here’s my question to you: How are you going to deal with election-withdrawal? Mississippi and woke up to such destruction. sound byte damage that's been done to my brain. couple of weeks to go through detox. You would do us all a favor. Jack, ask me that one after tomorrow. This has been an amazing race. We've seen the good, the bad and the ugly. Emotional highs and lows. Volunteering tirelessly, making phone calls, staying glued to CNN. I'm glad it's almost over. But if Obama loses, I will be on the first plane to Canada. After almost two years of listening to all the candidate's, reading all the editorials, watching all the news, I'm giving my ears and eyes a break. After tomorrow's votes are in, I think I'll just pray that the next four years are a far sight better than the last eight. I have no idea. Is there a patch? By getting ready for the next one! When Obama wins I guess I can finally go back to work after I find a job. If Obama wins, there will be no withdrawal – only celebration! How will I deal with not being anxious all the time? How will I deal with knowing there's a plan in Iraq, and my friend will be coming home? I think I'll deal. Just remember there's still quite a few weeks for old George to get our country into deep trouble with crossborder wars. In a desperate attempt to save his legacy. Also are the deals of defense and deregulation which for some absurd reason this leader can make. How dumb is it, that the guy leaving office in Jan 09 is making defense contracts that pay into 2011? Finally I hope to god that Prop 8 fails and we don't restrict rights for anyone. I'm going off in search of a life. Maybe I'll read a novel, paint a picture or take a walk with the cat. It begins tomorrow, right after the race is called for Obama. I can't wait. We will have to resort to watching the republicans scream about Acorn, Solialism and how to Anti-Americans are now running the Country. Now wait, wasn't that the election? Maybe we can watch a Governors Empeachment, a Senators removal and Sarah Palin in Washington after all as she quotes "I've done nothing wrong". The withdrawal will be made a lot easier with a victory by Barack Obama. There will be a sense of a new dawn in this country. Our eight year nightmare is coming to a close. It will be the end of an error and the beginning of an era of getting the country back on track domestically and internationally. I'll be extremely happy when this is all over, we need to re-focus our energy on repairing the economy and our standing in the world. I will be celebrating Obama's victory with my friends and family over a glass of champaigne. Then, it's anticipation to see how quickly Obama can get started on making much needed change for Americans. The same way I deal with the streeses and problems I experice each day: I drive home, run 6 miles, then watch CNN. I will take great joy in watching intelligence return to the Executive branch of our government, and slowly but surely, watching our country renew itself into the great nation we were before we sold our souls for a check in the mail. I will deal with it but breathing a HUGE sigh of relief if Obama wins. Then I will celebrate! It will be a great thing for our country and the rest of the world. Hopefully once Obama is elected we will all be able to watch significant signs of progress in bringing the troops home and slow but steady rises in your domestic economy. One thing I am sure of is the rest of the world will be reaching out to help America in what ever way they can. I will deal with it by breathing a HUGE sigh of relief if Obama wins. Then I will celebrate! It will be a great thing for our country and the rest of the world. Withdrawal, Jack are you serious? I cant wait for this thing to be over so we can get back to some sense of normalcy. I've got so much gray hair now you'd think I was running. I am a (legal) immigrant, waiting on my papers. If Obama wins, i'll address myself to becoming an American. If not, i will pack my bags. McCain/Palin make me feel unwelcome. I will finally go out and find a JOB!!!!!!! For the last 8 years I have spend a large amount of time following the news. It has been a roller coaster ride for sure! I'm glad I kept myself informed, it made it easier to make decisions on future plans, voting, finances, career choices. I think I'll catch up on my favorite tv shows. Though I'll always keep my finger on the pulse of the country! Let's see No more "My Friends, You betcha, I'm a POW, I can see Russia, Joe the Plumber, were winning, the surge, yup, come Wednesday it will be a new day in this country, not having to listen to any of the above statements and come January seeing the moving truck hall the Bush's and Cheney's and their administration out of the WH, I may just celebrate Christmas all over again Jack! I'll be going to Disney World! I will be very happy when this election is over and George Bush and some of his corrupt buddies are gone. In my opion, i feel Obama will win by a landslide, having said that, Mr. Obama is in for a heck of a long road ahead of him. I feel it will take at least 1 term, maybe 2 terms to reverse the damage that George Bush and this Congress have done to our country. Well my husband will be very happy he won't have to listen to it 24 7.My worry is what is CNN going to do? A bit sadden actually. The US election has reignited my own political interest and i figure it´s been the same for Americans. We cant yous´t forget all until the next election and start over. Democracy is an continuous thing, for when we relax democracy is threaten by greed and coruption. Start lobbying to kill the rcession. First move, imports to meets US Health & safety Standards and imports to pay for inspection costs. There will be no withdrawal. As an person who is going to be writing in Ron Paul on my ballot in California, the work isn't done. Neither Sen. Obama or Sen. McCain haven't talked much about inflation or monetary policy which are truly the issues needing to be discussed. Jack, If Obama wins I will be praying every day for him and his family,if McCain wins I will be praying every day for me and my family. Wake me from this bad dream...if the Republicans manage to steal another election, I will throw a dart at the Canadian map and pack my family up and move. This country will erupt if McCain wins...if you thought the Chicago riots in the 60's were bad...hold on to your seats...it's going to be a bumpy ride. Thanks for waking me up...Obama won, the world is our friend again and the country we all know and love will prosper again. Well if obama wins it will change me a lot and build the confidence of believing anything is possible if you work hard for it. I hope and pray I will be celebrating the election of President Barack Obama. The reign of terror will be over and the people get to take their country back. No more polls, no more tv ads and no more fear and smear. If Obama wins, I will be looking positiv into the future evn though I know it will be a long and hard road to get us out of that hole. If McCain wins I will start making plans moving to England. I will be applying for an international drivers license, book a flight and I am gone. Jack, I look forward to television and newspapers not obsessed with the campaign. Of course, I will not welcome increased speculation on the economy as well as on how well our new leader will do. I hope this is a hint for you and all your fellow newscasters. If Obama is not the winner I will work hard to make sure that everything he stands for exists in my life. If he is,I will do the same. Jack, I am really hoping CNN will run as good of coverage of George Bush moving his things out of the Peoples House! What a great day that will be!! My websurfing has been the most illustrative of my election obsession. I seem to have only five websites that I visit – repeatedly and in rotation. And they're all politics, all the time. What websites did I frequent before the campaign began? I can't remember. Maybe I'll spend my new free time getting to know normal things again like Ebay, the Weather Channel, and the Onion. Not very well...I know this will all be over tomorrow and I promised myself I will not visit CNNs, FOX, or MSNBCs websites during work hours. Instead when I get the urge, I will pray for the leadership and security of this country. HALLELUJAH!!! The same way you deal with post Oylmpic, US Open or football seaason blues. Once it is over I will go out and buy a newspaper and try to figure out what will happen next time. It's a vicious cycle that we live. I'm having a hard time already, and it's not over yet. Not much action on the Ticker today. It'll be a shock, that's for sure! Talked to my brother last night in Iraq, most of them hope that Obama will win so they can finally go home (his fourth tour). We will bring our troops home and progress. If McCain wins I will not able to find a job again and I will be hoping for my brother since he will be going back there another four times. jack: I will shout HURRAH – WE DID IT -for President Obama. It's going to be an adjustment. I'm a political junkie, and this election has consumed my attention for months. I'm happy that it's almost over so I can return focus to other facets of life. My daughter will be so happy to have something on our family tv besides CNN. Sorry! IF Obama-Biden WIN AND the Democrates can get to 60 in the Senate, I'm gonna PARTY like it's 1932 because I think we will see a 21st Century New Deal for American workers and the middle class. "back again, BACK AGAIN. We've got Franklin D Roosevelt back again......"
First of all I'll thank God. Then I'll watch CNN and see how they're handling it. Some analysts will probably need to seek professional help. Looking forward to getting back to normal, what ever that means. Has to be better then all this arguing back and forth. Oh my. Never mind. Forgot that now we'll have to anylize who the next President will choose for his staff and why. Guess not much will change after all. I will be relieved. This is the first election I have ever followed. I was electrified by the positive messages of Obama, and sickened by the attacks of the opponents, usually pressing the mute button. This world needs a change and I hope I can relax and watch it happen when Obama gets elected. Without all of the political ads on television, I just might start enjoying tv again. The real fall out of this election won't be understood for years to come, when analysits (read monday morning quarterbacks) finish putting their spin on things and future campaigns try to adapt to all the things that impacted these campaigns. Jack, It will be difficult. I have lived and breathed this total election cycle now for over a year. In many ways I'm pleased it's coming to any end, frankly, my nerves can't take much more. I voted last Monday. Go...Obama-Biden!!! A good cigar, a scotch and water, and watch someone else do the CNN news , because you people deserve a BIG break and some R and R. Thanks for being there through out the entire campaign!!! In American politics there is always a freak show to entertain the masses, it never ends. As an American currently working in Canada, if McCain wins I will join most of the people here and around the world in praying for America. There won't be any. I'm hoping to rarely, rarely hear the annoying voices and opinions of either Ms. Palin or McCain. I worked for Obama and a local candidate and I feel good about my contribution. There will be four years to keep an eye on the next administration with the HOPE that it will produce positive changes, not the least of which being the mood of the nation. I will continue to look for ways to help people who have lost their jobs by giving to food banks, buying clothes and back packs for children who cannot afford them. I will try to be a "community organizer" which I never saw as a dirty word! They have a special place in history for caring and helping. I will read books, cover up to keep the heat down, and be thankful we have a democratic president in office who will help the people I am concerned about–who knows, I might be one of them one day if they privatize social security. The last two times, when Bush prevailed (I didn't say 'won') I just stopped keeping up with the news altogether for about a year. Should Obama somehow pull this off I will do the same thing again, as it would be equally unfortunate, but on the other ideological extreme: neither he nor Bush are qualifed for this most difficult of jobs. If McCain wins I won't be overjoyed, but at least he is ready and he won't be GWB, and my 'withdrawal' will be minimized. That's hard to tell right now, since I so want this one over. But being a news and political junkie, though I should give it a break, I'll probably check all my favorite news sources throughout the day as usual. The post-election period will be like a "get out of jail" card. The last 8 years have been a nightmare watching this country slip deeper into the hole the Bush-Chaney cartel have dug for us. America has lost the respect of the world, but even worse, it has lost the respect of the American citizens. I'll spend the next two months watching the Obama-Biden team flesh out it's administration. Yes, I dare to act like an 8 year old on Christmas Eve a day before it's official because I cannot imagine that we will be fooled this time. Hope is a candle in the dark, and I suspect tomorrow will bring a series of floodlights across the face of America. When Obama is elected my expectations and hope will be watching your brave young men and women coming home to be with their family and friends. This goes for Afghanistan as well since there may be some hope they can negotiate a amicable agreement for power sharing in that country and both our Canadian troops and your American troops can return from this hell hole as well. If Obama wins a sense of relief and pride in my country. If McCain wins a sense of forboding and I will be very ashamed of my country. It has been a LONG 20 months of campaigning in both parties. I'm happy it's over with. Still, as a political junkie, I'll be eagerly watching to see who the victor (hopefully Senator Obama) selects for his Cabinet and key White House positions. It will be even more interesting to see if the two parties actually get the message that Americans want them to work together. If Obama wins, I will be sooooo happy....celebrating the return of an Intelligent, thoughtful person in the White House. I will be hopeful for my family's future. After a couple of days of being a lost soul wandering in the wilderness, I pray I'll come to my senses and remember that CNN and MSNBC are not the only channels I can access on my TV. I am fully prepared to sit in front of the television watching the POST ELECTION coverage, which I'm sure will be never-ending, so nothing will change here. By stop watching so much of CNN! That's not true. I will substitute election withdrawl with "President Elect-OBAMA" info., such as.............."the President Elect has chosen Al Gore to head his new "Eco Development Agency".......or "the President Elect -OBAMA will ask .... dot dot dot.....I think you get the picture. After the election, the job to rebuild America starts, I am going to be a part of the Reconstruction of the American dream!!!! If Obama wins, I will be so happy....celebrating the return of an Intelligent, thoughtful person in the White House. I will be hopeful for my family's future. I will spend post election waiting and watching how the new administration makes change – and how much time it takes for them to make these changes. I'll also be watching the world's reaction as each country extends their hand to welcome the new president. (or doesn't) It will still be interesting .. with I'm sure.. some drama! If Obama wins, I will be singing "Happy Days Are Here Again" and will still be a CNN news junkie, listening in every day and relishing how wonderful it will be to have a Democratic President again. It will be interesting to see who he picks to serve in his Cabinet and what his plans are for revitalizing our country after 8 years of Republican rule (seems more like 18 years). It will be delightful to hear all the details of the Inauguration and news about the Obama family and children! I pray the pundits are right in their predictions. It would destroy any confidence I have left in the wisdom of the American people if McCain/Palin win. I'm going to need a new obsession. Maybe I could get carried away with researching voter suppression tactics and harass my Senators and Representatives about election reform to make the process the same for everyone. It's hard to believe that the press took a pass on the dirty tricks of the last two elections. Otherwise, I could fall back on watching sports. Jack . I will take a short break , not from your show ,and find out where to sign up to volunteer for Obama's re-election campaign !! Fortunately for me I won't have to deal with election withdrawel because I will get to see Obama for the next 8 years and that is way more exciting than this election! As an observer, it will be a breath of fresh air to see the sickness of the Republican party yield to the Democrat party. I have waited my adult life to see someone come along and treat people with dignity and fairness. This election not only will affect the US, it will have an affect on the globe. If the Republicans win, what is a division in our society will become the Grand Canyon of the United States. It could destroy the US as we all know it. If Obama wins, it would be the greatest moment for me and i've learned alot from him and his family that helps my daily living. take a day off and then wait to see if we made the right pick . this will let us know which way our country's future and the world will go. I might be too busy getting ready to move to a different country if my candidate loses to have election withdrawl. Thank God! No more campaign commercials and telephone calls! Kick back and listen to the peace and quiet of not hearing the negative barbs being slung in all directions. I am sick of hearing the two for the greedy old party of making stuff up to try to win. Enough, Please. Better than Wolf and all of you guys, that's for sure. Jack, Obama has inspired me so much, I am going back to grad school to get my PH.D. He has changed my outlook on life. On Nove 5th, I hope the news is Obama is declared the winer becuase if McCain is the winner, we are going to be in trouble. He has deomstrated that he is not consistant and is very unstable. It depends on who wins. Following the 2004 election, I would not turn on ANY of the political shows for 3 months. I knew who won, and I didn't care to hear all the yacking that would go on as to how and why. All I knew was that it was depressing, not so much because my candidate lost, but because of who won. This time I'm hoping for a celebration-if Obama wins. I will handle it a lot better if Mr. Obama wins. Jack I think you shouldn't ask a question like this. I'm already smoking 2 packs a day. First, I'll start with a champaigne toast to Obama with a great sigh of relief. Then I'll reflect on the campaign, Good thing that Sarah Palin ploy didn't pan out, Wonder what she's doing now. No I don't. If McCain wins, we will both go get jobs to pay for the tax cuts for the wealthy Then we may join a church and learn to pray for his good health. Otherwise we'll continue to try and enjoy retirement. Election withdrawal? I'm not going to have any withdrawal, but I'm going to celebrate that it is FINALLY all over and done with except for all the crying. Maybe that elusive job I've been looking for will appear. The worst nightmare I can possibly imagine is waking up Wednesday morning to learn that the election has been stolen one more time. I'm leaving home on election day morning. I'm going where I have no cable TV and most of the radio stations that come in loud and clear are religious. I'll be able to get about one and a half channels on my 35 year old trinitron from it's rabbit ears. That will be enough. I'm not a God fearing person, but heaven help us if McCain wins. We'll be facing both a world war and a deep depression. Withdrawl? What withdrawl? I am a political junkie and I know that we will rehash, relook, recast, relitigate, reanalyze and rebroadcast every bit of this election until the next primaries start. Jack, come on! The next national election is only 722 days away,..let's get started. I look forward to this election being over so that I can get back to my life. This election has really consumed the last 10 months of my life and raised my blood pressure with all the ups and downs. I will tune into Wolf and you Jack because I know you will be following whoever gets in to see if in fact they walk the talk. Tom, The Heart of Democracy, Avon, Me. I'll handle it just fine. It will mean light at the end of the tunnel. We'll be able to say goodbye to anti-American policies, to rewarding companies for shipping our jobs overseas, to transferring middle-class money to Big Oil. We'll once again say, "Hello" to rule of law and traditional American values. We should not be quick to celebrate. Bush and Cheney are MIA. They could very well "jack up" those electronic MONSTERS, as they've succeeded in the past - TWICE. This action would cause riots and possibly a civil war. Then Bush will move in with their secret plan: "MARTIAL LAW." He's already secretly signed the Executive Order that would grant him the "dictatorship" power. Have anyone seen him and Cheney lately? Hmmm. I'll be looking forward to the coverage of the troops coming home to their families for good. Moving all of the equipment out of Iraq, and the coverage of finally finding Osama Bin Ladin and putting him to justice. I look forward to all the peace agreements and foreign policy advancements we will make. I look forward to watching the American people coming together for the greater good. I look forward with HOPE of all the wonderful things to come with President Barack Obama at the helm. Withdrawal? You sound like the election is the end Jack. It's not, this is just the beginning. Come November 5th, WE THE PEOPLE , who have built a monumental grass-roots network on behalf of Barack Obama and the democratic party have a massive clean up job to undertake. It will take years to reverse the crimes of the Bush regime and we've only just begun. The better question is how are you going to deal with it. For too long now you have had nothing but negative questions about McCain and or Palin. I can't help but wonder what YOU will talk about. I won't miss your negative attitude. If this election is not won by honesty, I'll stop listening to political news and pray that the future of the United States will be safe for my children and grandchildren because I know McCain will not only keep our troops in Iraq but will be starting a war with Russia and Iran. If it is won with honesty, I will be celebrating the prosper of our country for the intelligence, judgement, hope and dignity here and around the world that Barack Obama and Joe Biden will bring. I don't know how long it will take for this election to go away. No matter which side wins, there will be some form of "hanging chads" that rears its ugly head. No politician ever takes the "voice of the people" at face value. i will be dealing with my prayer . WE ouside US are waiting to see president obama. God bless jack and obama.. I will be waiting in front of the TV to watch CNN coverage of our troops coming home and our American jobs coming home. No withdrawal for me–I'll be so happy all those nasty ads are over! I wonder how the punits & the surrogates will deal with it. They'll have to find something else to fill the air time!!! Let's see, I'll drive a U-haul truck all the way to Washington, D.C., Pennsylvania Avenue of course, and offer my assists to Mr. Bush to help him get his crap out of the white house. January 20 can come soon enough. I had intended not to vote, but have changed my mind. I will cast my vote alongside that of my daughter for Obama. The future of this nation is in the hands of our young people. They are of every stripe, color and dot and thankfully not tied to the past. I hope I'll be celebrating Obama's election. After that,I'll be in The Situation Room with youself and Wolf giving input on other topics. Always enjoy the show! I will just switch to something with a higher level of inteligence. Such as a Bugs Bunny cartoon. I won't handle it well. I'm completely addicted. I'll probably have to find some new friends too now that I've driven most of them away with 2 years of Obama mania. But hey, there are always the first 100 days to look forward to! No matter the outcome, I have decided to start participating more actively in local politics, because ultimately, state and national politics are influenced and changed by local politics. And my chief objective is the standardization and depoliticizing of the election process itself. When people working for companies making some of the electronic balloting machines admit that they can change my vote, I want to make sure that that doesn't happen ever again! I will attempt to get back to doing whatever I was doing before this all began but for the life of me, I can't tell you what that was.....it's been a looong election season. The world is waiting you . the world needs you . I will enjoy watching television without all the lies and half truths, I can hardly wait. Catch my breathe and then hunker down for 3 months while I hide and shelter my finances from Obama, Pelosi, Franks and Reid, before the 2010 Congressional Campaigning begins. I don't know why the networks even look for new shows when they've got the DC Dog and Pony show. If Obama wins, I will enjoying surfing on e-bay, if McCain wins, I will probably have to spend my time on Monster.com looking for a job. I don't think I can stand 4 more years of following politics like the past 8. Being a political junkie, I fully expect to go through heavy withdrawl symptoms such as the shakes, night sweats, loss of appetite, and the dreaded blank gaze at an empty TV screen. I'll job hunt in the morning, go to my gym in the evening to try to destress so I can start anew on Wed. Regardless of who wins, I'll be so glad when this is over. I do hope that the winner will not wait to start working on the economy so those of us looking for work can find something better than min. wage oppertunities. I told my husband if Mccain wins I want to move to a smarter country if Obama wins I will be inspired that this country can become great again and be what it once was in the eyes of the world before the US went "rogue" and invaded Iraq on lies. As for election withdraw it will be replaced with watching the new admin. with a magnifying glass fix this country. I'll finally be able to stop refilling my anxiety medication and sleep – it won't be withdrawal as much as it will be hibernation. I'm exhausted by this marathon, I can't fathom how the candidates must be feeling. If my hunch is correct and Obama wins then I will channel the energy I put into the election back into my work and community. It has been hard to focus and do anything else since the Democratic primary. I need to move on, seriously. By continuing to stay engaged. This is not the time for us to avert our faces and become indifferent. Indifference in the past 8 years cost us – our reputation in the world; our economy; our division and our inability to speak up when we watched CEOs walk away with millions of our collective wealth! We are required to stay awake and alert and engaged. Wednesday morning I will tune into Fox and Friends and laugh until I can't laugh anymore..then I'll tune to CNN for real news! As long as you are still on here with your daily questions Jack we don't need to go through withdrawal. You will have much to ask us about President Obama, or if the worst happens, we will have much to laugh about again for another 4-8 years!!! Well .. there are always other things to do. I voted a week ago, so my withdrawal has already started. I stopped watching the most of the news shows on cable and that has helped. Also I have all but stopped posting (this is the exception) to websites on the subject as well. I am so tired of this election and its dominance of the news, I am going to asiduously avoid any (and I mean ANY) news about the next adminstration, the "historical moment,", any news story with the word "change" in it, anyone who uses the words " failed policy" or "my friends." This is the first election I can remember when I feel so saturated with analysis and sound bites that I actually don't even want to hear the new President speak for at least 3 months. I have no problem with the election almost being over! It's been too much and way too long. I'll enjoy some peace and quiet on tv for a while........at least until the next crisis comes along! I'm going to keep watching you, Jack, and see how you all handle it. There will probably still be a lot to talk about and hopefully we won't hear McCain's name much anymore! I will be looking to see if all the promises will be met? I believe the battle is just begun, no President can accomplish anything without the people behind ( him or her ). We especially need both the Congress and the House to support the presidents agenda. So this is far from over. When Obama wins he will bring the country together, but he needs all of us , Dems and Repub's to lay down our anger and get busy making this country work for the people reguardless of polictical affilliations. I'll transition by stressing on how to afford tickets to the Obama/Biden inauguration. I'll celebrate with a sigh of relief and a cold one! I still haven't figured out why my friends in the U.S. need 20 some odd months and 24/7 news coverage to elect a president when we in Canada can go to the polls after a five week campaign. It seems like overkill to me. and ....yes...oh...darn...yes !!!!! I am not American... I am Canadian!!! Jack: I'm already working on how to critize the winner....especially when it is time to deliver the promises...but then again, I expect you Jack to come up with some new questions....one nevers withdraws....it is the process that changes. The celebration of Barack Obama's win is likely to result in a hangover that will significantly overshadow any problems with election-withdrawal. Besides, there will be lots to discuss and critique between Tuesday and Inaguration Day. There will be no rest for the Cafferty bloggers until all of the world's problems are solved. First thing I will do if Obama wins will be to switch to the Fox News Channel so I can watch Sean Hannity pop his cork. That should be entertaining! If Obama is elected. I'll be sending my resume to his attention because I feel newly- inspired to work with his administration. If he's not elected, I'll immediately volunteer for his campaign in 2012.
as long as it takes to see that my vote is counted as I have done in every election since I reached the legal age. This is the only way I can honor my founding father who signed all three documents to give us our freedom. He use both his pen and his money so we could say that this country will be ruled by the people for the people by voting for their elected officials. I am going to start watching something besides CNN on my television. I am sure the other channels still exist. I can't take anymore of Wolfe's ties. Jack, If Obama wins, the post election withdrawal for me will be non-existent. However if McCain would somehow manage to win I will be in shock and total disbelief. It depend on who wins. If Obama-Biden wins, it will be an easy transition and I'll go back to watching COPS more and CNN less. If it's McCain-Palin, I'll be in therapy trying to find the meaning of life. Jack are you nuts? It's not election withdrawal, it's freedom from the pundits, candidates, and endless speculation. I should have at least six months freedom, before they start the whole damned process again. It's gonna be rough Jack! I'm really glad it's football season, I may be able to ween myself off of politics, by increasing my dose of ESPN, and NFL Network alittle each day, to ease my withdraw! Come Wednesday, I want to keep an eye on the winner's actions to choose his cabinet; this will give me a better idea what to expect after January 20th. For sure we will hear post mortems ad nauseum, but the election was not my career, and won't be. I hope it's Obama! I will also pray for the loser-to accept the defeat with graciousness and good will. The MSM will probably switch the 'Murikan sheeple back to Paris, Brittany, Idol, Survivor, CSI, OJ, -and they'll might even get started on "Campaign 2012!" But with a McCain victory (via Diebold), I won't have to worry about SELECTION-withdrawal, I'll be worrying about WWIII, The Greater Depression and banishment to a Halliburton detention center. I'll probably start going to the library again. I was an avid reader before and I've hardlly turned a page in the last couple of months. When Obama/ Biden win, I'll cancel my prescription for Wellbutrin! I will set back, after Obama wins and watch the stock market go up and up. Just like it did when Clinton was elected. If Mc Cain wins, I will watch with utter disgust as two fools fumble around, with Cindy watching every move, just like she did during the campaign. If the election goes as I hope (Obama), I plan to dance, sing and celebrate for a solid week. I'll find something else worthwhile to occupy my time after that. There is an election going on? I hadn't noticed. With a "Good Riddance Party". No matter how you look at it, or who you vote for there are no winners as long as polititians win. Just more of the same either with the old label, or the new. My neighbor had a good idea when he said that we should invite all polititians to Washington, then while they are arguing, build a very tall fence, and keep them there. I'll drink to that !!! I will quietly celebrate the victory of Sen. Obama with a hot bath, a glass of wine and just relax to let go of all the stress this election has given to people every where in this country! I am unable to tell you right now. I am scared for the final outcome of the elections. McCain is playing nasty ball the last two days, while Obama is standing steady. Well, maybe my nerves will be better. Withdrawal usually comes from something that provides you with an altered state or some sort of induced euphoria. Needless to say I have not been euphoric so I will have no withdrawal and I will enjoy the peace and quiet of no more distortions at least until the next election cycle. I go back to play WOW online. If OBAMA wins, the anxiety will be over for me! If McCain wins, the anxiety will just begin. I will be leaving this country, for a democratic one! I will get some much needed sleep! With a sigh of relief if Obama wins. The anticipation is simply overwhelming me. It's like waiting for the teacher to give you your grade, or an inmate waiting for his sentence to be over, or like watching water boil. It all now comes down to the defining moment. Will justice be served? Will voters be disenfanchised again? Will voters make the same mistakes and keep the last 8 years going? Who will win? My chips are on Obama. So many questions and only until Tuesday to answer them. If Obama wins, I'll take a vacation. If McCain wins I'll take to the streets to protest another stolen election. I am kind of a news nerd...I love politics and watching all of this election coverage. It's going to be like the end of the baseball season...I am going to have to find something else to occupy my mind. If Obama wins, I'll enjoy watching the changes he makes...if McCain wins...I'll be too busy packing in preparation for my move to another country to have any withdrawals. The Bush years can't end soon enough. I'll just be happy that it's finally over. My wife will be thrilled I won't be watching my daily political shows and quoting her recent poll numbers. I guess I'll have to finish painting my house and doing my other chores. What a drag! will be the victors, but look what happened to ALGore. WE NEED CHANGE!!! It's going to be a change in my daily schedule, for sure, Jack. Having been a political junkie and blogging about it since the Primary Season, I am going to have scads of time on my hands, what for not being able to read CNN's Political Ticker items on the state of the presidential race and so forth. Guess I will have to actually have to work more! Will miss you guys in The Situation Room. If Obama wins, I open a bottle of champagne. If McCain wins, I open a bottle of bourbon. I do not believe there will be election withdrawal for anyone after tomorrow. We will have all the election fraud from both sides to keep us entertained and on the edge of our chairs. But at least more attention will be put back into the current crisis we face with the economy, for that, recovery will be a long time coming. If Obama wins, I think he will institute some form of participatory government to keep us all engaged. If MCain wins, I think there would be a mass exodus to Canada, except that in investigating that as a possibility, I have discovered that Canada does not want us all to come there, so that may not be an option. There won't be any withdrawl. This country and the world has enough going on to fill the news and open the door for political arguements and philosophical debates. As for me, I'll still be trying to convince our leaders in Washington, D.C. to please end the military presence in Iraq and bring my daughter home. I admit it – I'm a political junkie. After Obama wins tomorrow, I'll be following his selection of advisors and Cabinet members. They are going to be incredibly instrumental in effecting the change we all are craving. Hopefully we will see Obama win this election, but I will be sad to miss the Palin bloopers. Probably the best way to fill in the time is to watch more hockey games although it's not as rough and tumble as your elections it will help fill the void in my desire to watch full contact sports. Can't go back to the soaps, nothing could ever compare; nor reading novels nor going to movies. No writer could ever dream up what we've just seen over the past 2 years. I don't know Jack, help! I'm sure it will be much more devastating to the media than the public. Most of us will be glad it's over. I will take a long shower, curled up in the fetal possition. And, wonder if the dirtyness will ever be washed off. When Obama wins, I will open up a bottle of champagne, celebrate and party all night long. If McCain wins, I would have to drink 2 gallons of whisky and sleep it off knowing that the headache of the hangover the next day is nothing compared to the headache of the next 4 years. If Barack wins, it will be so refreshing to have a President that believes in the American people that I'll get right to work building community coalitions that place our Nation's children first, empowered and energized by a presidential vision that sees Americans as partners rather than treats us like pawns. If McCain wins - I'm moving to Canada!!! I will be busy planning new business expansion if Obama wins. Next year this time, I will be busy preparing tax returns to find out how much more tax I will have to pay. After all, if I can make much more due to a better economy, I will be happy to pay more tax. I rather make more money and pay more tax than make less money and pay less tax. Well, maybe the election will live on until the judges vote in the Swing-State Supreme Court cases. Maybe we should buy extra hot dogs, popcorn and soda for the weeks ahead. I will be delighted to have withdrawal from politics online if Obama wins tomorrow. However, we all need to be sentinels for democracy in the future. If any Religious extremist begin campaigning for 2012, it will be our job to remind people that extremism cannot take over our country. Whether its a Muslim extremist in Iran or a Christian extremist in the US, we need to remember our belief system in this country and separation of Church and State. After the election, I think I will be able to stop drinking and get back to reality! It all depends on who wins the election. If Obama wins, then I will have a great time watching my Republican friends and family member turn livid. Whereas they vehemently denied the existence of any remote possibility of vote tampering in 2000 or 2004, they will claim that Obama's victory is a sham and part of a vast liberal left-wing conspiracy. On the other hand, if McCain wins, then I'll be going to grief counseling and asking for heavy dosages of anti-depressants. There still will be plenty of politics after an Obama win. First will come his vacation (probably to Hawaii to be with Grandma). Bush will come out of hiding and make a fool of himself and try to start another war. McCain will go back to the Senate. When Obama returns from his rest, he will probably get busy picking his cabinet and trying to get Bush not to commit to anything long-term, interferring with his Presidency. And the beat will go on and on. Within a year, the race for 2012 will begin. It won't end, not by a long shot. By watching cartoons. That is the only thing funnier then an election Jack. I think I, and the collective world will take a giant breath of relief that we made it through, that we decided well, and that the American people have elected the best person in Obama to bring this Nation and World together. It will be hard to handle McCain winning. I would have been alright with that if he had not picked Palin, but I just can not get over that choice, and that possibility to be a reasonable conclusion to 2 years of this race and 4 years of our future. Once this election is over I will look forward to being able to take a deep sigh of relief. I'll be able to pry myself away from the T.V., work in the garden, read a book, or take a day just to listen to music. I'll never completely withdrawl form my attachment to politics, to staying informed, or taking an active part in my community's politics; this election has taught me that I can make a diffence, I do have a voice, and I must always care enough to vote. If Obama wins, maybe the counting of votes won't drag into the night. It will be a relief to get this election over. I think I'll just tune into Fox News and laugh, and laugh. and laugh! After all said and done.....OBAMA wins. I will visit the U.S with more confident and peace of mind. Like many others, if Obama wins, I'll feel uplifted, with hope renewed. If it's a republican victory, I won't be watching news programming and I'll just feel angry and sad for our country. I feel anxiety every time, I hear McCain speak and I change channels when Sarah Palin appears. As far as television programming, I'll go back to HBO, MAX, TNT, USA, etc. Bush has never been "my" president and neither will McCain/Palin. As for now, I'll pray and vote. Get back to those tasks I should have been doing a long time ago. Now Americans have been made aware Alaska is part of the U.S. I expect the press will be reporting on all of Palin's ethics violations and corruption charges for a couple of years so this fill in the void for at least a couple of years. I will look forward to rebuild USA if Obama wins. I should get ready for another war with Iran and economic disaster (whatever left of it) if McCain wins. I will handle it by putting my phone back on the hook. No more robo-calls!!! Wahooooooo!!! That' easy. After " DUMB, DUMMER AND PLUMBER" republican freak presidential campaign I will miss all fun they provided. jack...like many of the ex-pats who left the US and came to Argentina after W won.... if Obama wins...most of us will come back to the US..there will be no better solution to an election withdrawal than seeing MCCain-Palin lose. My husband says during all of this I belong in a home. I do have that bumper sticker that reads" 1-20-09 END OF AN ERROR that I will put on my car. What this whole process has done for me was energize the student in me...I went and discovered info on the Obama/McCain that wasn't being reported. That discovery has fueled the disire to return to school and finish my degree. If Obama gets in then there'll be help for me, if McCain, well, back to the mines! Go Vote! That's easy, Jack. I have recorded the best of the Cafferty File (most notably the show when you called Sarah Palin's interview with Katie Couric "pathetic". I will watch them over and over. 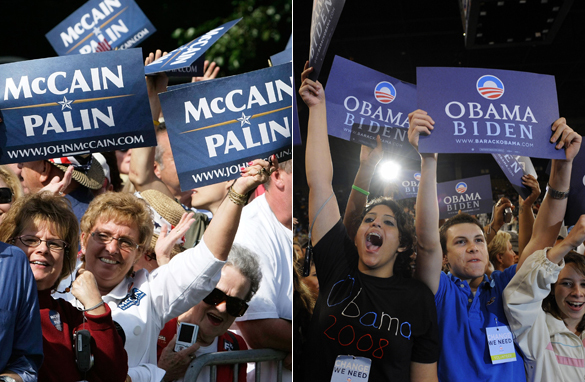 2008: the election that just won't go away! How will I handle election withdrawl? I won't have to worry it seeing I will be basking in the glory of a Demcoratic win! Celebrate Obama's victory – hopefully he'll do a dance and we can all pick up on his slick moves. I can't fight the feeling that we will still be talking about the election in the coming weeks. With all the fraud, unsecure voting machines, strategically placed police checks, possible race issues, this won't be over tomorrow! I will support President Obama and most likely give him some advice. I will also give advice to the new congress people elected. We cannot just let our government run without the inputs of the voters. We must be involved. Bush would listen to anyone, did what he wanted. Obama will be a listener, and his job is going to be very difficult. Ralph In Arizona. Just drinking my coffee and prayinng Barack has his track shoes on. read the news from the rest of the world. I have missed knowing what is going on elsewhere. I will also read news to follow up on whoever wins, and see if they are staying consistent with what they promised. I also want to see what is done about issues that were not addressed in the campaign. Jack this will not be over for at least another 10 days. It will be so close that there will be recounts and challenges. Who knows maybe even longer. I won't be sorry to say goodbye to the stress of waiting and wondering. That said, I hope I will be breathing a big sign of relief because Barack Obama has won! I'm going to handle the election withdrawals the same as any other life changing event in my life.....buy a 12 pack of my favorite brew, get in my swing on the back porch and clebrate OBAMA'S victory!! I will be waiting for the Republican Machine to start there attacks on President Obama, just like they did Bill!! I have never seen a party that could tell a LIE over and over until it became the truth. I guess that' s how they get their name the GOP. My doctor will be pleased as my blood pressure will come down, I'll stop eating so much, exercise more, quit being so snappy to my family and friends and maybe feel more normal again! Is there a rehab program specializing in political junkie withdrawls? I may have to try something less addictive like drugs..
Jack, I'm hoping you'll get me through it. I will be celebrating the most joyful day of my life when I see the landslide victory by Obama and brothers. I will fell on my knees laughing when I see the American public through the Republicans where they deserve, history's garbage. I will be proud witnessing history unfolds and all minorities be inspired (and I am white). The court challenges to the election results begin Wednesday. Its just the next step in a broken, rigged, and corrupt election system. it's up to you Jack. what will you have on the Cafferty files? what ever it is I'll be watching. If Obama wins I will sleep good at night. If McCane wins, I will sit up nights wondering when and how he will mess up my social security and medicare in order to feed the fat cats. Jack, I've got my strategy all planned out, I've gone around my neighborhood and gotten the addresses of all my neighbors that have McCain Palin signs in their yards, hopeful Obama wins and then I will send a sympathy card to all of the mean, hateful, arrogant and down right sorry republicans that voted for McCain in my area. Drinking the tears of the republican losers. A sure cure for depression, anxiety, obesity, club foot, craziness, baldness, ect. Nov. 5th will be a lovely day for 50% of America and 100% of the free world! First thing I'm going to do is get a good night sleep. I haven't really slept in 2 years. The second thing I'm going to do is pay my bills. I haven't done those either. Beginning Wednesday, all of the pundits with short term contracts and memories, will bore the hell out of us with what happened and why they think it did. Thank God for DVD players. If Obama wins, I'll relax. If McCain/Palin win.....I'll just be depressed. Very depressed. If Obama wins, I will continue to be a junkie, following all his cabinet picks, ect. If McCain wins, I'll pull the covers over my head and hibernate for the next four years. After 8 years of hell and wondering how America could have gone so wrong, I'll finally get a good night sleep and awake to a new beginning for America - a return to a government for the people and by the people where I can feel proud to be an American. Good bye Palin and McCain! After a big sigh of relief I will live on with the pride of knowing that I worked diligently for the campaign to elect America's first African American president. I am happy that, in some small way, I assisted in the creation of a new view of our nation in which my children will not know of a time where a person is excluded from an office or a position because of his race or her gender. Hello Jack. This sure has been a long drawen out process. I remeber coming home from Afghanistan in 2006 disenchanted with the direction our country was heading and worried about the unity of our country with all the problems mounting from the poor decision this administration had made. Then the primaries sparked a hope inside me that this new guy Barack Obama was speaking about. i thought no way this guy can beat the Clinton Political machine. But he did. Now one day left,hope that a new day in american politics will take hold. Jack this primary season is where i also found the cafferty files thanks for all the hard work you have done letting people sound off to your questions. I know that at times it took its toll on you. Now the outcome is out of our hands a decision will be made that will set the coarse for our country. May God Bless us All. I am not sure what I am going to do. If Obama wins I wil be more at ease and relaxed but if some how Mccain wins I have a feeling I am going to feel the same way I have felt the last 8 years. Not liking who is running our counrty and wishing Obama would have won. Pissed and I will be one of those picketters, you bet ya!!! after 22 months of constant election news, I plan to ween myself off cable news by one hour each day. I also have to finally clean my house. I'm driving over to the outer banks, and, weather permitting, will sit on the shore and cry. I hope it's tears of joy that we finally have an intelligent, honest, hard-working president. If not, it will be tears of shame, disappointment, and despair that the Karl Roves and Rush Limbaughs of the world have stolen another one. In 2004, a British newspaper published on its front page: "How can 62,040,606 people be so stupid?" Now, in 2008, I'll again be looking toward the foreign press, to get a a clearer picture of just where the country is heading. It depends on who wins Jack. If Obama wins, I will breathe a sigh of relief and go on with my life. If it's McCain/Palin, then I will go stark, staring, foaming at the mouth insane. Jack, we'll all be fine. OJ's sentencing is coming up and we'll get to obsess over the "must have toys this christmas". Besides, there's a good chance the lawyers will keep the election going for a while. Seriously though, I will miss the fact that this election has opened many minds and fueled many heated exchanges. It's good when we all care. If Obama gets in it'll be great.........If ole Mac wins we'll be sick for four years. as much as i am sick and tired of listening to the same old speeches from either side, i believe the end of the election is only the beginning of the next four years of this country. while it only brings a temporary sigh of relief, it will leave americans with whole new concerns about the direction of this country, despite who wins. Knowing there are going to be some angry people after this election either way it goes, I plan to withdraw from anger and pray for the healing of our Nation. I'm going to watch old movies on AMC or TMC.....unless Mc Cain wins...then I'll get a prescription for something to make me not care, and start packing to move to Canada. I'll celbrte by asking John McCain on Wednesday if "He's got em where he wants 'em? I wonder what his answer might be? Depends on who wins...If my candidate wins I will continue to be part of the mix...till January 20th! after the election iam hoping things get even more exciting, iam stocking up on popcorn and coffee , hoping for a front row seat at the bush, Chaney,rumsfeld war crimes trial's. they say if you wait long enough the right things prevail over the wrong, it's called Carma, jack. I am certain there will be other political crisises that will be either forthcoming or generated by the media - so, especially if Obama wins this election, there will be years and years worth of political fodder for us junkies - Or maybe we'll start discussing Paris Hilton? We are starting to wean ourselves early. My husband and I are going to watch the Redskins and Steelers game tonight. Oh dear I just found out at half time the candidates will be on. I tried Jack! I cast my ballot last week, I'm hanging up on all the robo calls, muting all campaign commercials, pitching all campaign literature that arrives in the mail...You see, its already over for me, I know Obama will won, all thats left is his acceptance speech. The true celebration begins when the "villiage idiot" returns to his hometown in Texas. Oh it's going to be very difficult for me! I do my day of work, then I go into my kitchen and cook dinner while watching the Situation Room, then finish up by watching HOURS of CNN...HOW WILL I COPE without all the information? Oh and I forgot to mention the HOURS spent reading the blogs and polls online. I might need some therapy – especially if Obama loses. I expect to finally get some sleep instead of staying up all night watching and rewatching the news for any hint that Obama is moving up in the polls. Say a prayer of thank you, take a good hot bath and settle down to my regular television program before the election,. I'll probably wait to hear the analysis of what happened on Wednesday and then it's back to normal. I honestly believe I'll have my piece of the pie. either be Vice President elect or the new leader of the Republican Party. Both roles will give her plenty of TV time. "How to be a Spy" kit, take out the field glasses and keep checking out Russia. I have school on Nov. 5th, but I have a feeling it will turn out to be a great day once it is set in stone that Obama will be the 44th president. I also plan on buying a big Obama sign for my yard and a bumper sticker for my car and lots of T-Shirts. I hope to have those up or on for 8 years. They should come in handy here in Texas considering the fact that 1 in 4 Texans insult Obama and his family by calling him a Muslim still (and insulting Muslims for acting like they're 3rd rate citizens). There will be no withdrawls here, only joy and peace in the fact that the Republicans will not have 4 more years to run this great nation into the ground. Tuesday I will be online at 11 PM on CNN.com election center with a glass of wine and talking to my friend from Florida. She is for McCain and I am for Obama and we will watch the results come in. Who ever wins we will drink to them and then go back to our normal lives. could have elections in December. I was laid off from a $80,000 a year job three months ago, I'll be out looking for a job. I'll call home and record some fake "robo-calls" on my answering machine. What withdrawl Jack? From what I can see, Jack Bauer is gearing up for another season of "24" starting later this month, so that should keep me in tune with the goings on in Washington! Well Jack I'm hoping to finally get a good nights sleep. The thought of Sarah Palin in the White House has kept me up at night. If McCain wins I'll invest in a truck load of Sominex. If Obama wins. I'll tune in to see if I can do anything to help him rescue our nation. If McCain wins, I'm opening a travel agency specializing in one-way tickets. I will finally be able to sleep. Please go vote. It has to be a landslide so they are unable to steal this election with their vote flipping. I'm so addicted, I don't even want to think about it! The end of the election is really the beginning to solving our problems of economy, energy, national security, health care, education, and climate crisis. That should keep all Americans busy for the next 4-8 years. As a college professor, my job is to inform my students about these topics. Love your segment everyday. You tell it like it is. Good question.........one I can't answer. I wish I knew myself. If Obama wins there will be plenty to watch as he rebuilds our democracy. If McCain wins, the wife says we will turn off the TV because things will get too depressing to watch anymore. If Obama wins, I'll enjoy the intelligent changes in direction for the country: fiscal responsibility, new energy plans, new infrastructure, health care rights for everyone, etc. I look forward to some grown-up leadership. It's been a long time coming. Hey Jack, Maybe we can actually focus on SOLUTIONS to fix all the problems that this country faces. Wednesday November 5, 2008, isn't that the official start of the 2012 Presidential campaign? Jack, the real work starts Wednesday. How are we all, as Americans, going to be a part of the solution? Give my laptop a much needed rest. Actually, they'll probably still be counting the ballots. Guess I'll start rearranging the living room to make a spot for the Christmas tree while I watch "Meet Me In St Louis" with Judy Garland with the sound full blast. Well, that's if Obama wins. If McCain wins I'll put on "Scrooge"
Good question – if McCain wins, figuring out how to move to Toronto, since we can't stay here. If Obama wins, enjoying the success! I have a question for you and Wolf Blitzer, what will you guys do after the election? Not sure what the Situation Room will cover! Either way, looking forward to continuing to watch, as we are hooked on the Sit Room! Somehow, I don't believe that we'll have to go through withdrawal for a long time. Regardless of the outcome, we won't hear the end of this for a while. If McCain/Palin wins, it's historic. If Obama/Biden wins, it's historic. Although, I believe the latter outcome will have us reeling a lot longer than the first. The election coverage is getting old and tired, but I might be able handle another few weeks of craziness if we get an Obama/Biden win on Tuesday! Okay, I admit it ... I'm a news junkie. I will focus my withdrawl enegry on how I can help Obama (our new president) attain his message of change to make the USA a better place for all. There will be no withdrawal symptoms here. Just enjoying the peace and quiet, the boring and mundane news, and a nice book in what little free time I have after working my fingers to the bone. It’ll be like coming down from a two year sugar high! it will be easy to get over this election. John McCain by his own actions has shown that as a candidate he has destrioyed his legacy, the legacy iof his father and the legacy of his grandfather. After all the news programs over-anylize the results and I've had my fill of that, I'm going to devote my time to writing a good enough comment to get read on the Cafferty file! Jack – If Obama wins we will have stability and peace and I will be one proud American. I will be more than happy to pay for Sarah Palin's one way ticket back to Alaska. It depends on who wins. If it's John McCain, I plan on hibernating for the next 4 years. If it's Sen. Obama, I'll eagerly look forward to his speeches and press conferences the way I did JFK when I was a schoolgirl. Jack, either way, there will be no withdrawal. If Obama wins, it will be like a rock has been lifted off of the chests of the American people. We will all finally be able to breathe again. If McCain gets elected with Palin, we will start trying to get them out of office on Wednesday, November 5, 2008. Don't worry Jack – all of you will be picking Barack Obama's cabinet – so, you will have lots of politics as well as determining an area large enough to hold Barack Obama's inauguration (as I am sure the whole World will be looking for invites – I know I am). Jack, I'm looking forward to all the dirt that the MSM refused to cover finally coming out about Obama. Mark my words, a year from today half the people who voted for him will regret it. Oh I don't know, reading again? Jack Im very excited for this race to be over. I might actually get something done! I wanted the president to be Hillary soooo bad and when that fell thru, The race was never the same for me. Gotta go clean something!! Ha! I for one will have post-election blues. I've been following the US election as a non-American and little else has made me so interested in politics overseas. If mccain and the north country bimbo should somehow be declared the winners, it will be because of massive election fraud, and I will set to work fighting the results. If Obama wins, as he should, I will keep praying for his safety. In my 65 years I've never cared so much about who wins this election and can't even imagine living under the questionable leadership of a McCain/Palin adminstration. It is that depressing a possibility. If Obama wins I will be proud and will celebrate! If McCain wins, I will be looking for real estate in Canada!! You said tomorrow, the party's over. You just jinxed it, Jack! Remember 2000? I won't believe it's over until President Obama is sworn in on January 20th. Then I can relax and stop making plans to smuggle my son out of the country so he won't be drafted in McCain's pointless wars. Jack, It's a funny feeling when you realize that you are in living in history - being a part of creating history. I'm 47 years old and have never felt that before. I'm guessing that the withdrawal will be tough, but like you, I think - at least if Obama is elected - that we will be asked to be a part of the solution. And gauging by how well he has done so far in inspiring the American people, I think we can be optimistic about the future. It won't be the roller-coaster ride of this election, but I think we may just see something subtly amazing. I'll be watching for it and ready to be a part of it. Jack – I will start by reading a good book ,yours in fact. Jack- ask me that question after Obama is elected as President. If Obama wins, my headaches will go away, if he loses, I'll need more pain medication because McCain and Palin will be in the White House. God help us all if that happens. I'll finally be able to sleep well knowing that President Obama is leading our country! If McCain wins GOD help us. We better start bunkering down cause we'll be on our own AGAIN if McCain wins. I'll just be glad when it's over! I am counting on CNN to let us down easy with a series, "Best of the Campaign Bloopers" at least until American Idol comes back on. I think you are nominated to entertain us! We are going to experience a collective and painful hangover when faced with the realities that now are upon the incumbent and American people. Ironically, the election has been a huge distraction from the issues at hand. When life resumes to normal on Nov. 5, I think it will be shockingly painful for all of us. WITHDRAWS?....Palin has already started campaigning for 2012. Idon't think we'll have to worry bout election news. By celebrating the Obama/Biden victory. I am relying of you and Wolf to get me through my rehabilitation! Jack, it's going to be hard. I just I'll start planning for the Holidays. Thanksgiving is right around the corner. and Christmas will be here before we all know it. I'll do some dollar store shopping for Christmas this year, besides that's about all I can afford. After all it's the thought that counts. My withdrawal will depend entirely on who wins. If McCain pulls off the miracle comeback of all time... well then I won't have time for withdrawal because I will be packing my bags and moving back to Canada. If things go the way I hope they do I'll be rather busy. I work as an advocate for working people and haven't been able to find much help from the federal government over the last few years. I'm hoping for a pleasant change starting Wednesday morning. Collect my marbles and look forward to seeing Obama and family in the WH. and every tiny bit of news that I can get from you and the PC. If Obama wins I will rejoice and then start focusing on his Cabinet choices. I will sure as hell get a lot more work done. I'm going to clean MY house. That should take about the right amount of time until the next election cycle begins. I don't know ,we just pray that Barack Obama wins by a landslide and Palin goes home. It has been tough going through the highs and the lows of this election season. However, I don't think I'll have any lingering side effects at the end of the season. But the mere thought of having to go a week or two without the Cafferty File, as happened several weeks ago, brings on severe depression. Obama winning this election there will not be a need for an election withdrawal...people will be filled with hope and faith in a better life which indeed will require all of us to be part of the solutions. But if McCain wins it is not a withdrawal that people will be experiencing...I cannot even find the words to describe what it will be except this campaign has not given much to many of us the belief of his character as working towards unifiying the country! The real issues that we worry about do not disappear when we elect a new leader, the media will not be without material, and we will have no reason to be in 'withdrawal' from the drama until we've fixed the issues at hand. Hopefully chasing it down with an "Obama is our new president" high! We've been waiting for him a long, long time, even before we knew it. Clean my house, weed the garden, tackle the work I have postponed, walk the dog and get back to normal. Unless somehow McCain pulls off a win. They I will stay in bed with covers over my head for the foreseeable future. Surely, you can find us something Jack. You always do. Relax, feet up, deep breath, and a warm shower..
Election withdrawal HA! Wednesday we start campaigning for the mid-term elections. I thought I did very well the last two elections!!! We will be fixating on reality, how the heck are we gonna bounce back? Having a new president won't make our problems disappear over night. I will be enjoying not hearing Sarah Palin's voice. It will be a day I am looking forward to. I won't have any withdrawals Jack b/c hopefully Obama should be titled. I plan on going camping this weekend. Aside from school and work, my other job is watching CNN and blogging. im going to do everything i can to support president obama's policies. I can’t speak for anyone else but this election has personally changed my outlook on politics and government affairs. I plan to become personally involved in community organizing and local government affairs to fill the void. There will be no time for withdrawal. The next President is going to have his hands full undoing the damage of the last 8 years. And he's going to need all of us behind him. Join EA (Electoral's Anonymous) like the rest of the loyal Cafferty watchers. I will have time to concentrate on my studies because they have taken a back seat these last months. It is hard to study when all the action is on the campaign. Wait for the third coming because the second isn't going to do it. Jack, if Senator Obama wins, I'll be dancing in the streets. If Senator McCain wins, I'll be looking for a 200 ft high bridge and a 210 ft bungee cord. It will be nice to see a politician voice a point of view without the fear of being called UnAmerican, Stupid, Godless or any of the other things the Republicans can think of to discredit any point of view other than their own – all opinions are valid – we can start working together even when we disagree – Hurrah! I've been wondering the same thing. I know I'll be bawling tomorrow night, one way or another!! After being thoroughly depressed for the past 8 years, I'll be able to breathe a sigh of relief. I'm going to Disneyland. Just another day post election. Nothing will change. we will have another bail out. another war, more scandals, etc. The 2 party system is just 2 sides of the same coin. Funny how fervent and partisan the country becomes during election season. Who was it that coined the phrase "Divide and conquer." I'll be volunteering in my community to help President Elect Obama get this nation back on track. No one can do it alone, we all have work ahead of us. Only Tina Fey can help me with my withdrawal until Sarah Palin graces us with her presence again in about two years. get more sleep, get more work done, and enjoy T.V. without all those political ads....and celebrate not having to listen to Palin's voice and Ya betcha ........mmm silence is golden!!!! This has been the longest running soap opera I have ever seen. I have been totally engrossed for the past 2 years and tomorrow is the culmination where the hero saves the nation from the evils of the past 8 years and ushers in a new beginning for the country. I will be following with keen interest his selections of cabinet members, preparations for the inauguration and his first state of the union address. I'll probably shoot my TV. If I can actually hear the words President Obama from the MSM I will be ecstatic.. If I don't hear those words then someone will need to call 911 and have them do a wellness check on me since I will need to be taken for medical assistance before McCain does away with my Medicare and Social Security.. I will have no effect from election withdrawl. The time will be to lend a helping hand to our new president (Obama, that is). It's time to unite this country and not continue dividing it. It's amazing how much hatred in people in America today. I"ve been recovering for the last two weeks. Early voting started in Texas on Oct. 20th, and I got it over with. How is the media going to handle election withdrawal? If it ends up a close result then Wednesday might not be the end – I hope it's a landslide so we don't spend the rest of the week recounting votes... I really need a rest. I will celebrate not having to endure any more negative ads or politicians who will not forthrightly answer a direct question. I'm going to sing to Sarah Palin...Na, Na, Na, Na...Na, Na, Na, Na,....Hey, Hey, Hey GOOOOODBYE! I believe I'll have election relief. Thank goodness it'll be over soon. Whomever you're supporting, get out and vote, if you haven't already. I can't wait to remove that ugly padding on my walls which we installed to prevent injury from us knocking our heads every time John McCain said the words "My Friends". The first week I'm going to rewrite my budget program for the new deals promised. Then when I find out I've been lied to I will curl up on the couch and watch old movies till Spring and if its as late as last year was till Summer. The one thing I know for sure good or bad the cable news will be banned from my home. I guess I'll have more time to look for a job after being laid-off! I can't wait until this election is over and the Republican grip loosens so that America can once again breathe! I'm hoping to lift a cold one and cheer Barack Obama. If McCain wins, I'll lift several to drown my sorrows. I will have to check into political rehab and go completely cold turkey on CNN. I won't have to "handle" it! My guy is going to WIN! Start getting ready to support President Obama for 2012 of course! I have plenty of homework that I have put off to help elect Senator Obama, so I'll have plenty to do to catch up before the end of the semester. I'm only hoping that I am doing it with a smile on my face in an Obama Administration. I'm currently 11 years old, so its perfectly acceptable for me to go back to watching Disney, though I feel a little sorry for Wolf. Depends on who wins. It McCain wins, I'll be ecstatic! If it goes the other way, do not look forward to the next day. Will be glad that the election is over so life can get almost get back to normal! Sure will Jack. I have voted every election since I turned 18. This is the first election I can remember I was truely excited about. Can't wait to get off work at 5:00 tomorrow night and watch the results. Probably will need some double shot lattes to get me through Wednesday and the rest of the week!!! Withdrawal? Don't you mean celebration? I'm going to be so excited when all these campaign signs are in the trash cans, political ads are off the air, and I hope to never hear Sarah Palin's name again!! I might even find Joe Six Pack and drink one of his beers!!! I will continue to do my Online Blogging as usual. That is what keeps me sane and involved politically. I probably will have to enter some kind of news junkie anonymous. My boss will be happy to get me off the computer and my Dr. will be happier with my blood pressure results. After I've watched Obama's acceptance speech and McCain's concession several times, I'm going to indulge in some serious gloating. Once the Obama fever subsides, I'm going to find out who might be running against Sarah Palin in 2010 and send them some money. I'll also spend some time making snide comments about the red states. Then I'll think about how to make Christmas fun when the biggest gift on earth has already come early. Jack, to help overcome political withdrawals I plan on Zzzzzzzzzzzzzzzz. Sleeping more. And knowing that Mccain (trigger happy McGee) is not in office, I will sleep a lot sounder. All the mistakes, prank calls and smear ads. Election Withdrawal? It'll be an addiction to the news about the transition. No matter who wins, the transition will be the new news. If Obama wins, as I suspect, the transition will be especially interesting. I can hardly wait! Having been politically charged for almost two years, I'm going to sleep in on Wednesday. After I awake to a new country, I will begin writing my new book – a unique look into the election fever which has infected politics in this historic time. I've been compiling my research and have already started the rough draft. After tomorrow night, I will be able to construct the ending and determine the tone of the book. Either way, we'll have an Italian dinner with a great red wine. If our candidate wins, it'll be a great celebration...if he loses, it will be a good way to lift our spirits! I'm going on a strict exercise and diet plan to lose 21 months worth of the 21 pounds I've put on from election stress eating! My focus will shift of the health of the election to my own health! My waistline will thank me by inauguration day. My friends will be celebrating election night with champagne. I'll likely have a few beers and wake up the next day to get a copy of a newspaper that will remain in my family for generations: "America elects its first black president"
Can't wait for this to be over. Maybe I will have a normal life again and be able to relax, read, walk. I will make a committment to myself to live a healthier life because if Mccain wins I may not be able to afford health insurance after all. I hope that I can wish Obama a successful presidency! I think though I will put up my laptop up for a couple of weeks and stop watching CNN for at least a couple of days and try to find a different interest! Well, I suppose that Brittney, Lindsay, Paris and Miley might provide some entertainment between speculating on President-elect-to-be Obama's cabinet announcements. Otherwise, I'll still be looking for a job. What makes you think the election will end tomorrow? I refer you to the 2000 debacle. This one could go on for weeks! I anticipate a Supreme Court decision pronouncing McCain the winner by early December. Stock up on Diet Cola and Jiffy Pop, Jack; it's going to be a bumpy election. I plan to get up early and sling mud at my neighbors. If they complain, I'll tell them I'm a maverick. I'll be able to eat since I'm fasting and praying for Obama. I guess I'll start watching the sitcoms again! I'm going to TIVO and watch all the retrospectives of the past two years I can find - gradually reducing the number of hours each day. If McCain wins, I'll eat all the comfort food I've gathered the last months. If Obama wins, I'll throw it in the garbage 'cause I won't need it. If McCain somehow wins, I'll take to drink and probably become an illegal immigrant in one of our neighboring countries. Once I finish breathing into a brown paper bag, I'll eat some comfort food – like chocolate or a brownie sundae then try to find something interesting to do that will take up the time I used to spend watching the news. I don't think I will suffer the withdrawal like CNN staff will...an excellent job to say the least and I thank you for staying on top of it all and feeding my addiction. Well Jack, I will be soaking my tired feet! Because After Sen Obama wins I'll be doing the Happy Dance all night long@!!! Go Obama! This feels like when I got married. 1 year of planning, then the big day (will it go the way I have seen it in my head) then the honeymoon (smiles 24/7) then the real work. For all of us who have supported Mr. Obama let’s remember that the “real work” is yet to come. Like the energy conservation, the improving our communities, volunteering and spending quality time with our children. Then we have to heal some wounds with neighbors and co-workers, repair the racial divide etc. All of that should keep us busy until 2012. No! Once the election ends the drama about voter suppression vs. voter fraud begins. The lawsuits, riots and endless media analysis will be even more entertaining the campaign rhetoric. Jack,After the election will be a blast.We'll get to listen to an angry old man blame an incompetant running mate for the landslide loss.I will love every minute of it! Well Jack, I guess I'll get back to jogging, doing my homework, and going out every once in a while. I must admit that my news intake has been relentless, and I'll be glad for a break. That's why today I bought my Obama "Hope" poster. Whether he wins or not, the man was an inspiration. As fun as this has all been I'll be overwhelmingly relieved knowing that McCain is not our president and that Obama will bring a dawn of a new age, where citizens actually have a say in their government and the old ways of Bush put to an end. Jack, You're obviously worn out from the length of this campaign and can't see clearly. Beginning on the 5th the new drama will unfold with the lawsuits for voter fraud. See you on the 5th! Just glad that it will be over. Jack, I just don't know. In the same way that we ask ourselves how people functioned without cel phones, I will be wondering what anyone spoke about before this election season. I will finally be able to look forward to reading the news again. Spending as much money as my budget will allow on a fantistic dinner here in the city if Obama wins. Spend as much money a my budget will allow to buy enough ibuprofen as I can to deal with the head-ache of another 4 years of in-adequate leadership. Either way I am supporting the economy- and feel good about it. I will be very glad to not hear "My friends". A good way to deal with it is finding ways to serve our country volunteering and contributing to worthy causes. If half the energy devoted to the campaign is applied this way the sky is the limit. Thank God for the upcoming holidays! I'll be busy baking, decorating and making (with CNN turned on) so withdrawal will become exhaustion, hopefully, with a happy heart!!! Jack, I am going to celebrate because Barack Obama will be going to the White House!! Yeah!! That depends on the outcome. If McCain wins I will be looking for a place to live that won't be targeted by the countries he and Palin bomb. If Obama wins, I will be at work as usual, but much happier. I'm going to get my life back! I'll sleep again, watch something other than news, and tear myself away from news websites...to LIVE again! We won't have to go through any withdrawal. Sarah Palin will probably announce her candidacy for 2012 on Thursday and the media will be jumping all over it. I think its more financial widthdrawal then election. If the Dems win, it costs us more. If McCain wins it costs us less. You figure it out! Just say your Dem and we will call it Even! I'm going to get started on the nation's shortest political novel...naming the top 3 things that Bush/Cheney did well. I should be done before Nov. 5th ends. Sleep! Until Jan. 20 When whomever takes office and It starts over again! If John McCain wins, I will be packing up my house and moving to Northern Europe! If Obama wins I will celebrate with the rest of the WORLD! What withdrawal? Starting Wednesday, Palin will be campaigning for 2012! I'll fill that gap with preparations for my 'bye-bye Bush' party in January. Never thought about it, it's going to get depressing that's for sure, a whole year of excitement gone. I guess I'll find time to finish your book. Jack, on Wednesday, life as I have known it for two years, glued to the election tube, will be over. I will have to become addicted to some other form of sport! It may be a tad easier for me because I'M CANADIAN! If I were an American I'd probably need to go into therapy! I'm going to start paying attention to my children again. how will i take election withdrawal? i'll probably live in the nostalgia of it all and play with my palin cabbage patch doll, eat my cap'n mccain and obama o's cereal, and listen to joe the plumber's new country album. i think i will be just fine, but i wonder what all the news stations will do to make up for the dead silence...with no obama, mccain palin or bush for that matter to talk about and pundit over, i feel many of them might be laid off to...maybe britney spears will do something again to keep them all occupied..
Oh, I think I'll be fine. What I'm worried about is all of my favorite shows. There has been such a strong focus on this election in just about everything I watch that I've forgotten what those shows are like when there ISN'T an election coming up! Jack, I am not so sure we will have a clear winner tomorrow night. I am guessing it's going to turn into a nightmare of lawsuits, allegations of fraud, voter suppression and electronic vote manipulation, so I will be getting my fix watching the riots on CNN. I am planning a Wine/Cheese Party for Black Friday in my business. I will be host to my vendors–other merchants on Main Street in my town. Should take the three weeks to pull off, so to ease my withdrawal-Wine and Cheese Party on Black Friday! Happy Holidays! In the same way it was handled in 2000 Presidentials elections.Both candidates should go to the court, in the end we will get a republican President again for the next four years just as President Bush got. I'll spend the day going to classes and catching up on national, international and local issues that have been eclipsed by election coverage. This is my first election, being as I turned 18 in April, and I am ridiculously excited to vote Tuesday. But honestly, I look forward to Wednesday, when the New York Times will have something other than mundane tidbits of campaign coverage. Let's get back to reality. As important as it is, I will be so relieved to get it out of the way. I wish we could just fast forward to the part where Barack Obama is inaugurated. To keep me busy I'll join Sarah Palin on ,Dancing W/ the stars. I am so scared that the Republicans are going to steal another election that I've already begun avoiding news (sorry about that!) and trying to distract myself more. If McCain "wins," it won't matter how I handle the letdown–our country will be in even worse shape than it is now. You are the best! Once the election is over I can finally return to my graduate studies; lately I have been glued to CNN, and unable to focus on my assignments. My regards to the CNN team and continue to keep us balanced in the days to come. You're funny! I probably will have withdrawls; I've been a CNN couch potato for the last few weeks! I'm still going to tune into CNN every day to witness President Obama coming good on his promises. jack, i will have no problem with withdrawals, but i must concede i will have to find something else to do while in class at NYU law other than refreshing poll websites incessantly. If Obama wins, sell my investments before Obama can tax them, put some of it in an offshore account, take the rest and travel internationally for the next 4 years, and return in 2012 when the country comes to its senses and elects someone who's actually qualified to run this country. If McCain wins, stop by the nearest church and thank God enough people came to their senses. What election? This is the first time I've heard anything about it! I will be excited to FINALLY stop having anxiety attacks!!! What a great day it will be when we wake up 5 November and know that we will have Obama as our next president of the United States and the republicans can take down their McLame/Fakin signs!!! GO OBAMA 08!!! Withdrawl? There's plenty excitement left! When Obama wins, the world will be praying with him hoping that he is the miracle the US needs. If McCain wins, the world will be hoping he can survive his term in office otherwise, Palin's going to make it hard to be proud to be American. Rachielle from VA, you know very well you won't move to Canada if Obama loses. Why do people say this every election? You probably said that 4 years ago and guess what? You're still here. Jack This will just be the beginning of the fight to retake America in 2012. It will be a battle waged continuously to get the nation back to its Constitutional foundation. There will be no relief for the 2008 victor as the people fight back throughout his term in office. I think I'm going to be in trouble. My computer is locked on to CNN.com all day – and I refresh about twice an hour. I also watch at least two of the live rallies through the website. I'm going to go through serious withdrawal!! I'm going to miss the speeches and the inspiration that Obama gives me each day. I can't wait to call him my President – and I'm hopeful for the future of our country, and the world under his leadership. I'm going to cry and scream and dance tomorrow!! Wow jack, that's the million dollar question, I will probably EXHALE and the find something else to consume me all over again. What a ride its been. I'll be tuning into Saturday Night Live, The Daily Show, and the Colbert Robert much more often. I can't help but feel that a little political satire may salve the weals we've whipped into ourselves these last two years. What withdraw? The 2012 campaign starts on Wednesday! If Obama, sigh of relief and celebrate, If McCain, plan a move to Canada. When I get the cold sweats and start seeing things I'll just pop in a cd of Saturday Night Live & reminisce! by going to rodeos and enjoying the tumult and the bovine excrement. I'll still do the same things I've been doing every day: Go to work, come home, do it over again the next day. But how long the days feel and how energized I am for the foreseeable future is completely dependent on who wins. If McCain wins, it will be a very long couple of days. If Obama wins, I think getting up in the morning will get a bit easier. Jack, I've been following national elections and all the build-up that goes along with them since 1968. Thanks to CNN, I've had the opportunity to watch this election unfold day-by-day for the last 15 months. Election Day is America's great, shining moment. A day for which we all can be proud. But the letdown that follows on Wednesday – regardless of the election's results – is unbearable, kind of like the day after Christmas, except with Christmas, we don't have to wait four years. However, you good folks at CNN can help make the post-election withdrawal less painful. Just keep covering the political landscape as you always do – after taking a few well-deserved days off. There is potential there for that to happen. This has been so exciting, to watch and I can't wait for history to be made Tuesday night. Sure it will cause some tears for all the right reasons. The Champaign will be chilled. Though I strongly support Senator Obama, regardless who wins, it will be the END OF AN ERROR! I certainly will miss Barack Obama's inspirational speeches each day. In one sense I'm glad it will be over. On the other hand this election season has really captured the interest of a lot of Americans and I am afraid once it's over their interest will fade into hegemony. I'll be glad to have the uncertainty over but will live in great fear of the damage that will certainly be done to this country by an Obama administration. This has been the most protracted, disgusting, insulting and invasive campaign I can remember and I certainly won't miss it. Neither one of these jokers deserves to be our president! One shouting and ranting like a couple of WWII despots I'll be polite enough not to name and the other sniping at every opportunity. Time to get some additional legal protection against solicitors and robo-calls, next campaign starts in two days. I will start watching TV and reading newspapers again. When Obama wins, I will start to look forward to this country starting to heal, and then slowly beginning to prosper. I will look forward to seeing my sons and daughters begin to afford to buy groceries and gas again. I will rejoice, that soon, no more young american soldiers will lose their lives on a battle field, in a far-away place, where we did not belong in the first place. I will get over election withdrawal by going to Switzerland, where there is direct democracy. That way, the election never ends! I have spent the last 6 months glued to CNN, MSNBC and Fox News. So I can't wait for this to be done so that I can go back to watching regular programming. But still this has been an AMAZING race; the best ever. I already voted in the American elections awhile ago by absente ballot. "Fortunately" here in Israel we've got nationwide municipal elections next tuesday and national elections in mid february so I have lots of election debating ahead of me yet. All I need is a reminder every 4 years as to why I hate politics. It will be nice the moment this nightmare is over to prepare for the next. I wonder if there are any others here who like my self hate both candidates equally and will write in any random name on the ballot. I'm gonna keep busy by taking bets on how long before McCain dies, whether he wins or not. Nobody wants to bet on him past Christmas for some reason . . .
WHATEVER IS RECOMMENDED BY cnn. To reduce my election withdrawl I plan to indulge in more civil demonstrations of conflict such as Ultimate Fighting or COPS. Maybe I'll take up moose hunting. No I can not wait for this to be over and done with. Please please please do not let this one go past tomorrow night. I will be the first volunteer to help Bush move out of the white house and into one of John McCain's houses come January. Hopefully Senator McCain and Governor Palin can get back to their business in their respective states with their respective constituencies. For the sake of sanity, I'll be thrilled when it's over and O'bama is sitting in the white house. Yes.. yes... BUT I am sure the outcome of the election will give us plenty to talk about. Very scary question. In my case I have lotsa things to do that I have been postponing as I was either glued to my TV or surfing on the net almost always. But if Obama loses I will have no energy. I just might have to spend time with my 16 year old twins. Are you sure you don't want to run for a few more months???? For some of us, this election is the culmination of work done since the 1960's. Tomorrow cannot come soon enough and then it is off to the challenges of rebuilding America. I'll just be waiting to see how long it takes for everyone to realize they just voted in an inexperienced candidate based on hype and trend, who has no substance or record to back up his message of "change". Frank from Florida isn't moving to England. I'll probably not be watching this CNN or MSNBC nonsense. When Obama/Biden wins there will be no withdrawal. I will feel hopeful that this country wil be back on track. Go Obama/Biden!! I can't wait until this whole mess is done with...at least for another 3 years. Jack, if Obama wins I'll be ok. If it's McBush and Duffous, I'm going to be sick and afraid for the future of this country. I can finally start paying attention to my schoolwork, as I'm supposed to be graduating college in May. Maybe my new laptop will be used for what it's supposed to be instead of always searching over the news 😛 Wednesday will be a day of celebration though anyway because there's really no way McCain can win at this point. Hooray! Come on Jack – The reason we all voted early was to get this thing over with .... I can't wait to get on with the next phase – crucify the next administration – and bad mouth the last. If Barack wins, I will be celebrating. If he doesn't, I'm looking for a job in Canada. I will be patiently waitng for my TAX CUT & FREE HEALTH CARE JUST LIKE OBAMA HAS!!! I'm sure that a couple of chocolate chip cookies and a DIY home video of Palin parodies and uplifting Obama speeches will help me get through the emptiness I will feel without the fulfillment of political analysts. If Obama wins, I'm dressing in a bright red dress for school tomorrow, which may seem a bit nonsensical and ironic considering the fact that red is a Republican color. I'll bring in a treat for my AP government class, maybe blue frosted cupcakes, and poke fun at those who disparaged Obama and said he wasn't going to win. If McCain wins ... I'll let my parents sort that one out. And I will go complete goth on my classmates the next day at school. Jk. But I definitely won't be handing out cupcakes.